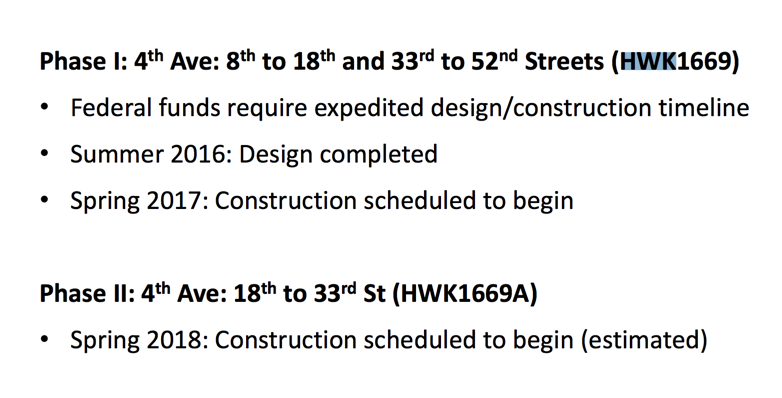 Implementation of most of the Fourth Avenue redesign in Sunset Park has been delayed to accommodate MTA tunnel repairs, pushing back the construction of curbside protected bike lanes until 2019 or later. Only about 10 blocks of the redesign will be built this year, and even that is contingent on the MTA’s progress, according to DOT. The original timetable had called for protected bike lanes between 65th Street and 38th Street this year, with a subsequent segment between 38th Street and Atlantic Avenue coming in 2019. A second phase of the project was slated to build those changes out with a top-to-bottom street reconstruction starting this fall. Now the timetable is much murkier. Although the first phase of the project calls only for temporary materials, the MTA’s underground work will disrupt the street surface, occupying a southbound car lane, said Community Board 7 District Manager Jeremy Laufer. DOT did not provide a timetable for the redesign north of 54th Street and said all work on Fourth Avenue is contingent on MTA construction. The Fourth Avenue redesign is the most significant street safety project in the pipeline for Brooklyn. CB 7 endorsed the project in January. When complete, the redesigned Fourth Avenue will provide safer pedestrian crossings and the first convenient, low-stress north-south bike connection through the neighborhoods of western Brooklyn. This is absolutely unacceptable. The sharrow double parking lanes on 5th ave are absolutely unusable for cyclists, and I get immense amounts of abuse, threats, honking and close, fast passes when cycling on 4th ave. Of course, it would be even better if drivers just respected my right to the road, but I don’t see that happening anytime soon. Oh man, that’s so disappointing! Does anyone have a link or any more info on the MTA repairs they’re referring to? Of course, MTA does it again. Who would be surprised. So confused too as to why they don’t just reverse the order and start on 38th to Atlantic first? DOT has significantly scaled back the number of blocks of protected bike lanes it plans to install on Fourth Avenue this year. DOT may not start the northern section of the project until 2021. Council Member Brad Lander wants a version done in low-cost materials before then.